We headed west on I-20 out of Atlanta heading for Birmingham, the location of one of the most dramatic confrontations in the Civil Rights movement. About halfway between Atlanta and Birmingham, around the town of Oxford, we jumped off I-20 for a quick detour toward the town of Anniston. 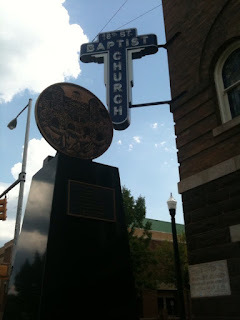 Anniston was the site of one of the most violent attacks on the Freedom Riders in the Summer of 1961. 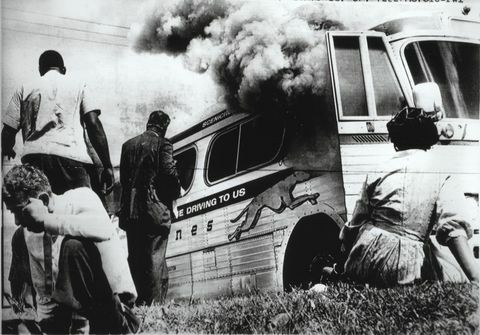 The Freedom Riders started off in Washington, DC planning to drive through the South to New Orleans. Along the way they planned to test the recently passed legislation desegregating interstate transportation, both on the buses and in the bus stations. Things went smoothly until they met a mob in Anniston. At the Greyhound station a mob attacked the bus and slashed its tires. 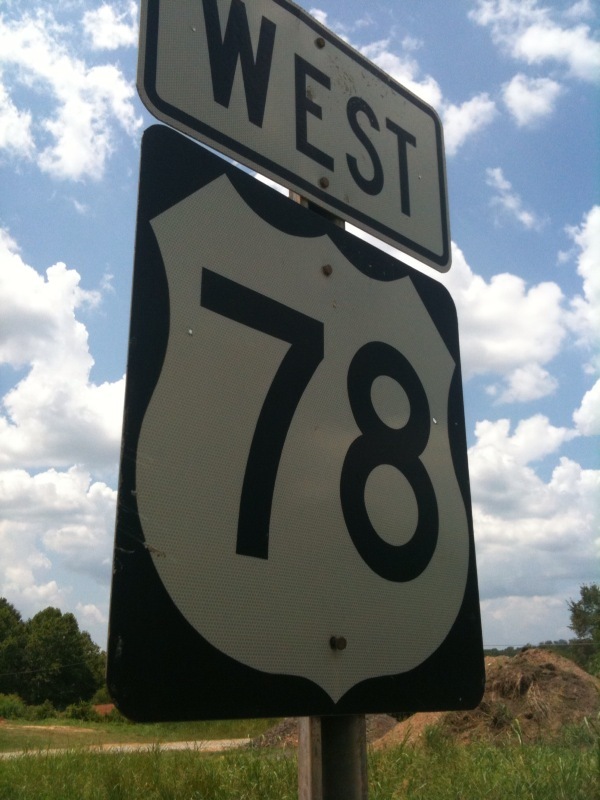 The bus raced out of town west on Highway 78 toward Birmingham. The mob followed in cars and trucks. A few miles outside of town the bus broke down and the driver ran off in panic. The bus was firebombed and the passengers badly beaten. No historical marker marks the spot of this event, so we just pulled over a few miles west of Anniston and took a picture of the Highway 78 sign knowing that the event occurred in this general area. After our time on Highway 78 we jumped back on I-20 and drove to the Birmingham Civil Rights Institute. In our judgment, the BCRI is the best Civil Rights Museum we've seen so far, which means it might be the best museum in the nation. The exhibits are state of the art and very interactive. If you are ever near Birmingham you need to make a stop. 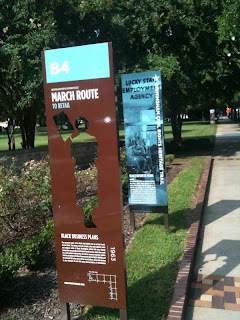 While the National Civil Rights Museum has the Lorraine Motel, the BCRI is also surrounded by history. Inside the BCRI you see the actual bars of the cell where Martin Luther King wrote his Letter from a Birmingham Jail to the white clergy of the city. 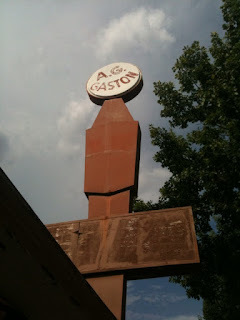 Outside the Institute, on the other side of the block, is the Gaston Motel (now abandoned) where King's friends pieced the letter together for publication after they had smuggled the bits of it out of the jail (King wrote the letter on scraps of paper). Directly across the street from the BCRI is the Sixteenth Street Baptist Church, which can be viewed through windows of the Institute along with accompanying exhibits. 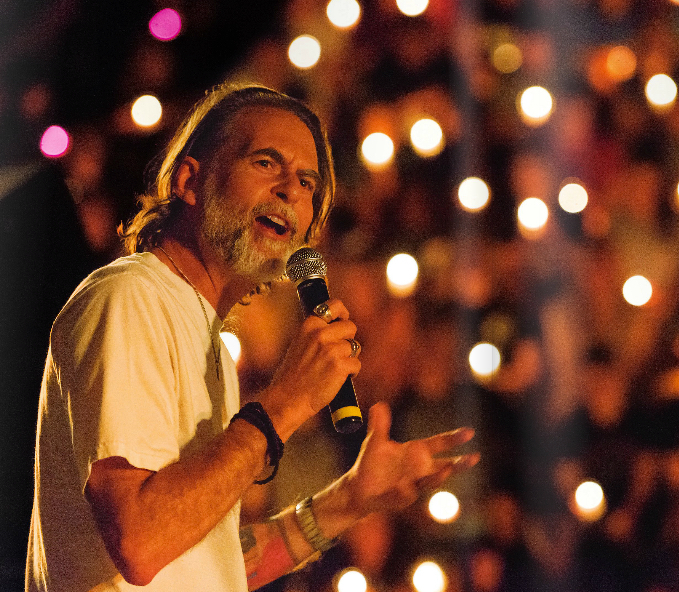 This church was the staging area for the Birmingham protests. After singing to get their courage up the protesters would get their marching orders and head out for the downtown retail district. 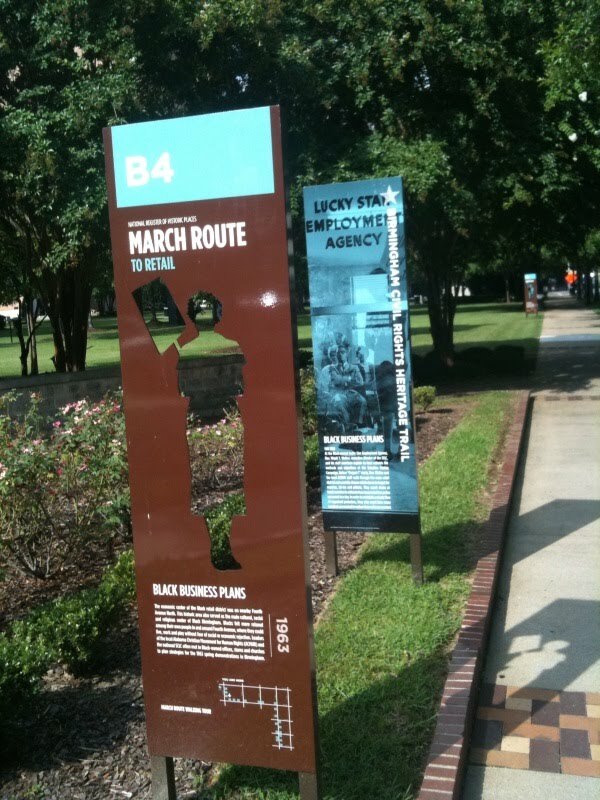 You can trace the marching route of the protesters by starting in Kelly Ingram Park and following the signs that mark the way. Downtown the protesters, mostly children, faced fire hoses, police dogs, and arrest. In the park there various sculptures that dramatically portray these events. 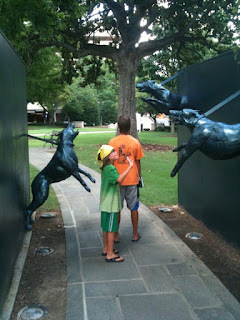 Here are my boys walking through a sculpture where you can encounter the police dogs. Aidan, and this perfectly reflects his personality, is waving merrily at the dog. On Sunday morning September 15, 1963 the Sixteenth Street Baptist church was bombed around 10:22. Four young girls were killed: Cynthia Wesley (age 14), Addie Mae Collins (age 14), Denise McNair (age 11), and Carole Robertson (age 14). 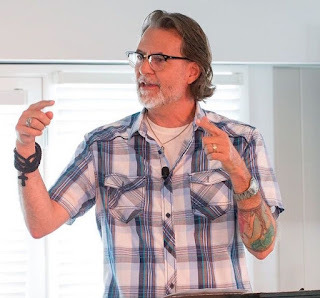 The title of the planned sermon that day was "The Love that Forgives." 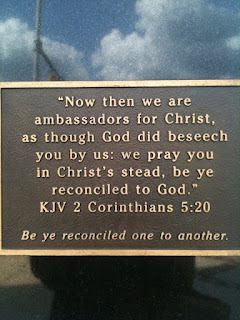 Because of the bombing the sermon never occurred. 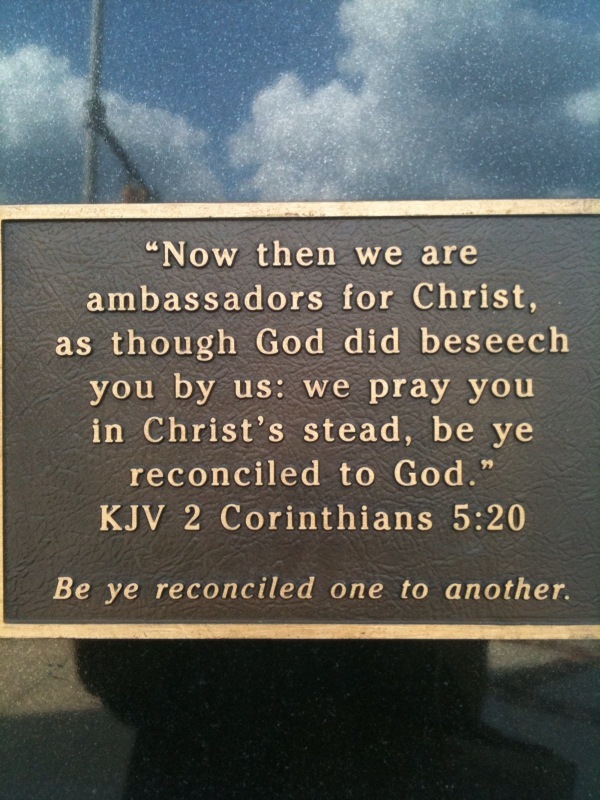 However, outside the church there is a memorial to the girls. Thanks for sharing this museum and trek through Alabama. If I have my research right, the mob came to Anniston from Birmingham where riders were also attacked after the Anniston incident. Thanks Richard. That would explain a great deal. I work at the Birmingham Civil Rights Institute and was very pleased to see your excellent commentary of your family's visit. Our organization is in the process of gathering quotes from visitors that we can use for marketing purposes. Would it be possible to get your permission for BCRI to use a quote for our web site or marketing purposes? Just let me know as we appreciate our visitors' comments! In any event, thank you so much for your favorable review of our organization.